Dieses geräumige Studio-Apartment bietet einen spektakulären Meerblick und einen einfachen Zugang zu allen Annehmlichkeiten des englischen Hafens. Das Apartment befindet sich in einer aufregenden Gegend mit vielen Aktivitäten wie dem historischen Dockyard von Admiral Nelson und Museen in der Nähe von Restaurants, Einkaufsmöglichkeiten und dem Bus. Sie können den Vulkan Monserrat in der Ferne vom Aussichtspunkt Shirley Heights sehen. Viele Strände und vieles mehr. Sie können sich auf der Veranda entspannen und speisen. Had a great time. Perfect spot for some R&R.. hope to return in the future. Fantastic Location the condo was lovely we had a brilliant time in Antugua. The property was perfect it had everything we needed and we loved it. English Harbour is a very vibrant lively place with lots going on and fabulous views across the harbour. Plenty of restaurants and bars and the beautiful beach is a 10 minute walk away. The host was very easy to contact and extremely helpful with all her advice on places to visit. Many thanks Orleene. Thank you so much Jane, for taking the time to write such an informative and positive review. It is always great to hear that my guests really enjoyed their vacation. Please come back anytime! This property was just where we wanted to be - a 10 min walk to the beach, and comfortable hikes, also so close to shops, bars, restaurants and the nelsons dockyard. I found yoga classes at the marina and the apartment had a balcony big enough for furniture and my yoga mat. English Harbour is a great base to explore Antigua from. The apartment was lovely, perfect for 2, if 3 people they would have to be family as you would all be sleeping in the same room. The only reason I did not give 5 stars is there was no air conditioning, which I knew when I booked it (as my husband doesn't like the eco issues of air conditioning), but I did get bitten, even so I would rent this apartment again. As advertised, my condo is a studio, which is, of course, one large spacious main room, including a kitchen with a 12.5 cu ft fridge, stove/oven, sofa, tables,a separate bathroom, etc. Also, there are 3 fans; 1 standing and 1 overhead in the main room and a small one in the bathroom. Since it has louvers with screens on the 3 open sides instead of windows, it seems impractical (and unnecessary most of the year) to install air conditioning (nor do I claim to have a/c, as the reviewer noted). Most importantly, I send all my guests a set of notes about local restaurants, beaches, etc and how to keep insects out by closing the French doors before dusk, and other tips. But I was unable to confirm that the above reviewer had noticed this advice. We stayed at this lovely condo in Falmouth Harbour for 10 nights and are absolutely thrilled that we chose this place to stay! The location is superb, right next to the Antigua Yacht Club and within walking distance of plenty of friendly and good quality bars and restaurants. It's also very easy to walk to the historic Nelson's Dockyard (that is well worth a visit). You are also close to Shirley Heights which is a must on a Sunday evening......although take care with the rum punch! If you enjoy walking there are some lovely trails to walk, including Desmonds trail up to Shirley Heights. The condo itself has everything you need for a relaxing holiday, and allows you to cater for yourself if you want to, which is great for preparing breakfast and an easy lunch if you are in the area. Being honest, it is not 5star luxury that you would expect from one of the big hotel chains, but then again, you are paying such a great rate for this area, and for us, it was lovely to stay in a place that felt very Antiguan, and gave us the flexibility we wanted. Finally, the booking process. It really couldn't be easier, and dealing with Orlene was an absolute pleasure from start to finish. She gave us so much advice and information before we travelled which made everything so easy. Also, Gloria comes in twice a week and really looked after us while we were there. 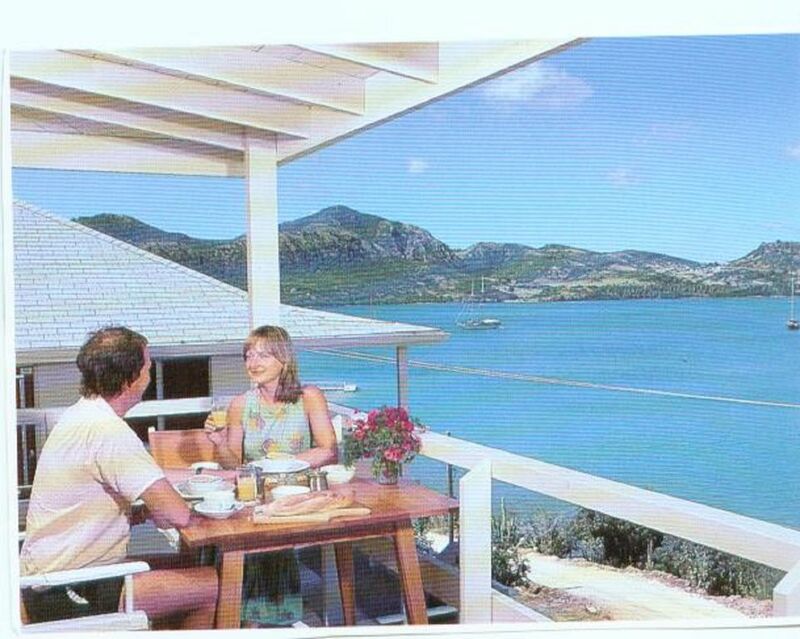 I'm definitely lookig forward to going back to Antigua and Orlene's condo at some time in the future. This is such a perfect place to stay. The condo is very convenient to everything and just high enough to afford a magnificent view. It is one of four in a small building so there isn't any/alot of noise from your neighbors. It is just minutes away from everything and unless you want to venture to other parts of the island, there is no need to rent a car. One thing we wished we'd figured out earlier in the trip was that you can join the Yacht Club across the street ($65) for a week and have unlimited use of the lasers - so be advised if you like to sail. The wind's always up! The condo is spotless, bright and airy and equipped just as advertised. The owner is highly attentive to your needs, communicates promptly and is a joy to deal with. The same can be said for the two people who will assist if you have any needs in Falmouth. We rented a car and took one day to sightsee the rest of the island. Unless you're into staying in an isolated resort, Falmouth and English harbor are the places to be. Lots to do, two fantastic beaches, and great, great restaurants. You won't be disappointed. Many thanks, Darcy, for submitting your thoughtful review. My condo is, indeed, in the town of English Harbour. The view from the balcony overlooks Falmouth Harbour, and the town of Falmouth is directly across the harbour; hence the possible confusion. Also, I supply all my guests with several pages of details about the condo, beaches, restaurants, etc. However, I am reluctant to include suggestions which may be temporary or seasonal.